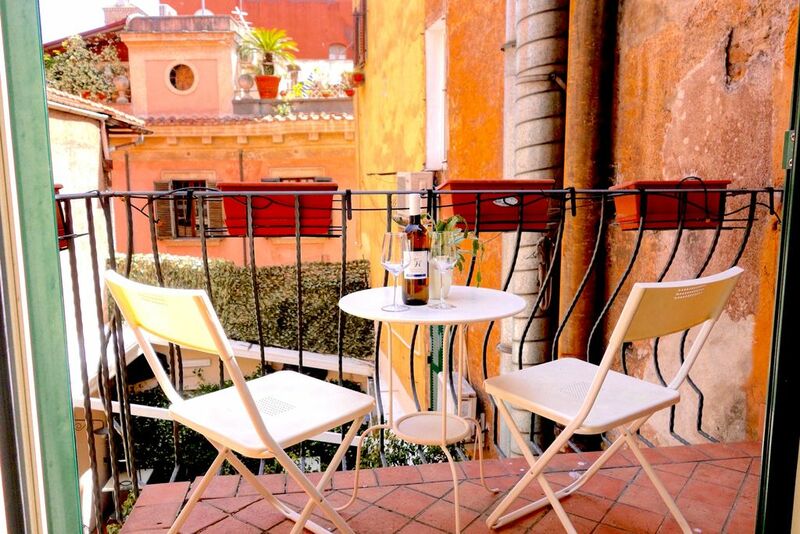 This up-scale second-floor apartment is located in the best part of Trastevere, near the Piazza Trilusso, one of Rome's most charming neighbourhoods. It has been newly renovated with sleek modern lines, fully equipped kitchen and luxurious modern bathrooms. The living room offers a fireplace for cozy evenings, and a small terrace off the separate dining room is perfect for outdoor meals in Spring, Summer, and Fall. The apartment is on two floors, with a master bedroom and bathroom on the first floor, and another double bed, plus a single bed, and second bathroom, on the second floor. Stroll narrow, cobbled streets lined by medieval houses, bars and restaurants. Outdoor markets and both charming and funky shops line the street too. At night both Romans and foreigners flock to its many pubs and restaurants. The area is also home to John Cabot University and the American Academy in Rome. You will be walking to St. Peters, the Botanical Gardens, Castle San Angelo, and the most beautiful Medieval Church, Santa Maria in Trastevere.Just a short stroll across the River Tiber (Tevere) is the historic centre, heart of ancient Rome, the Campo dei Fiori, Rome's most famous outdoor market, elegant Via Giulia, Piazza Navonna, and all the sites you will want to visit. The unique character of this ancient neighbourhood has attracted artists, expats, and famous Romans. Excellent location in cool neighborhood. Great facility, spacious, friendly staff, steep stairs, above restaurant so noisy. Thank you so much for writing. We are delighted that you enjoyed your stay and the apartment.. The neighborhood is an active and vibrant one, and the apartment is on a small street which itself does not get much traffic, and as the restaurant does close after dinner time, the noise is not normally an issue after dining hours, so usually it doesn't disturb people who are out dining themselves. I really enjoyed the property, it was clean, modern, and had all the little amenities required like plug adapters, quick hot water, plenty of clean linens, umbrellas, etc. There is a kitchen, living room, bedroom and bathroom on the main floor and another separate bedroom upstairs with its own bathroom as well. Our host and mgt company were very responsive to our needs. The location itself is in the heart of Trastevere, which is a colorful neighborhood about a mile from the historic tourist area in Rome, on the 3rd floor of a building adjacent to several bars and restaurants, and about 100 yards from Piazza Santa Maria. If you want to be in the hear of things, you can do no better. It can be a little noisy late on weekends, but if that is an issue you are probably not a fit for the neighborhood. But if you are looking to mix with the locals and try lots of food, I highly recommend this location. We had a great time in Trastevere! The location was perfect and the access to restaurants and cafes was amazing. There was always nightlife and things to do and see within a very close walking distance. We always felt safe. The charm and character of the apartment was amazing. Other reviews made it seem like it was going to be very noisy, but we did not experience that at all. Alessandro and Adriana were great and very responsive. Loved every minute! Our family of four had a wonderful week in Rome and in this apartment! This flat is very centrally located in a magical and charming neighborhood that seemingly morphs and changes each night with restaurants, shops, and lots and lots of gelato nearby! The pictures are true to the experience, except the bathroom is much nicer than it appears in the picture. Highly recommend. We are delighted that ou and your family enjoyed you stay, and this great family apartment, with plenty of room for all. Loved the apartment and location! Everything about this place is great. The location is FAB. The kitchen is well stocked. The owner met us with cool water and a bottle of wine. The beds are comfortable, the air conditioning works very well. I would absolutely stay here again. We are delighted to read your review. We love this gem of an apartment, too. Nothing like a glass of wine on your own terrace in historic Rome on a summer's night. This up-scale apartment is located in the best part of Trastavere, near the Piazza Trlusso, one of Rome,'s most charming neighbourhoods. Stroll narrow,cobbled streets lined by medieval houses, bars and restaurants. Outdoor markets and charming shops line the street, at night. both Italians and foreigners flock to its many pubs and restaurants. The area is also home to John Cabot University, and the American Academy in Rome, You will be walking distance to St. Peters, the Botanical Gardens, and the most beautiful Medieval Church, Santa Maria in Trastevere. Just a short stroll across the River Tiber (Tevere) is the historic centre, heart of ancient Rome, the Campo dei fiori, Rome's most famous outdoor market, elegant via Giulia, Piazza Navonna,and all the sites you will want to visit. The unique character of this neighbourhood has attracted artists, expats, and many famous people. There is an end clean charge of €130 for all rentals. Additional cleaning available on request. Rates for longer stays available on request. 50% deposit payable upon reservation. Balance due before 60 days prior to arrival. If booking is made within a 60 days of the arrival date, 100% of the rental due is required to secure the booking.